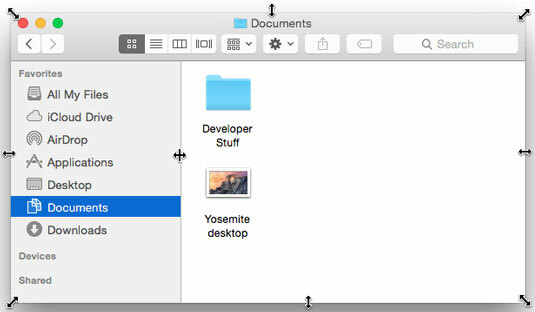 If you want to see more (or less) of what’s in a window in OS X El Capitan, just hover the pointer over any edge or corner and drag. When the cursor turns into a little double-headed arrow, as shown here, click and drag to resize the window. Hover the pointer over any corner or edge; when the double-headed arrow (resizer) cursor appears, click and drag to resize the window. Display windows, like those in the Finder, frequently consist of multiple panes. If you look at the figure, the line divides the Sidebar to the left of it and the actual contents of the window to the right. When your mouse pointer s over the resizing area of this bar, the cursor changes to a vertical bar (or it could be horizontal if the panes are one above the other) with little arrows pointing out of both sides, as shown here. When you see this cursor, you can click and drag anywhere in the dividing line that separates the Sidebar from the rest of the window. Doing so resizes the two panes relative to each other; one gets larger and one gets smaller.